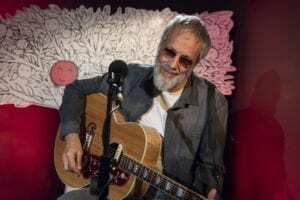 On Thursday 7th September Yusuf returned to his parental home/restaurant on Shaftesbury Avenue in London to perform an incredibly intimate show launching his new album, The Laughing Apple. Armed with just an acoustic guitar and supported by Kwame Yeboah, the performance harked back to the start of the Island records period of his career that saw such classic albums as Mona Bone Jakon, Tea For The Tillerman, and Teaser And The Firecat. The songs seemed to find their purest form served by simple stripped-down arrangements and the sincerity of Yusuf’s legendary voice. My experience of the event actually began the day before when I was privileged to be present for part of the rehearsal process. In a north London hotel suite Yusuf and Kwame were running through songs to perform at the launch but also with the upcoming tour of South Africa, Australia and New Zealand in mind. Sat either side of a table with guitars on their laps they would run songs and then refer to recordings and make notes on their laptops. Among the tracks I heard were “The Rain”, Here Comes My Baby” and “The Blackness of the Night”. Yusuf’s command of his material is unquestionable. His ability to sing and play the songs with complete control is incredibly impressive and is the strong foundation upon which his career is built. There was a bit of memory jogging going on and at one point Yusuf seemed to apologise for his voice. He was a bit low on practice and said that his throat was a bit like sandpaper. However, I was hearing the subtleties and nuances of tone and delivery that make his vocal so compelling. His voice has certainly dropped to a deeper timbre since the 1970s but it’s unmistakably the same. Kwame was learning some keyboard parts on the guitar remarking with a smile that he wanted to be prepared just in case Yusuf decided to spring something on him in the middle of the soundcheck. This kind of light relaxed exchange and the beauty of their playing together pointed to a trusting musical relationship. A particular highlight of the session was a rendition of “Here Comes the Sun” by The Beatles. Yusuf was clearly excited to play it and it was very special to hear Harrison’s classic given the Yusuf treatment. His voice seemed incredibly well suited to the vocal part and afterwards he remarked that he’d always found that George Harrison’s songs fit his voice. In a discussion about the considerable merits of Harrison’s work that ensued, Yusuf’s general excitement about music and the energy that it gives him was clear. He pulled up the video to “When We Was Fab” and we all marvelled at both the song and video. During a break from playing I asked Yusuf whether it felt like the old days to be playing with just the accompaniment of two acoustic guitars and he reflected that it certainly felt very natural. Perhaps there was something more to his choosing to share “When We Was Fab”, a song in which Harrison looks back at his earlier career. At about 2:30pm some PA equipment, amplifiers and electric guitars arrived along with engineers for a technical rehearsal ahead of the launch. The room was rearranged and everything became more stop-start. When Yusuf had sorted out a guitar sound that he liked and Kwame had set up his station the two ran through sections of songs. Again they played “Here Comes My Baby” and the harmonies shone as Kwame’s smooth backing vocal glided along side Yusuf’s lead. I left midway through the afternoon session but met up with Yusuf again later on that evening. Over a light dinner in the suite with family and friends it was clear that Yusuf had been frustrated by the scale of the audio rig for the launch event. He’d felt better with the more stripped-down sound that they’d had earlier in the day remarking that the excess of equipment and engineers had seemed like overkill. However, in the presence of family the subject quickly shifted to other topics. Yusuf’s eldest daughter, Hasanah shared photos of work that was being done at the Islamia girls school in North London. Yusuf founded the school partly to ensure that there was an Islamic school that Hasanah could attend growing up. The mood was relaxed and lighthearted and it was nice to see Yusuf interacting lovingly with his grandchildren. On Thursday the 7th September I arrived at the venue as it was being readied for the launch event. 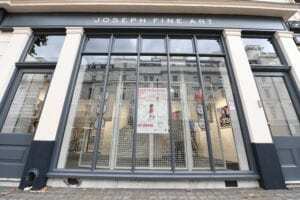 The Joseph Fine Art Gallery on Shaftesbury Avenue in London is where Yusuf grew up above his family’s restaurant. Many of the seminal songs that graced Mona Bone Jakon, Teaser, and the Tillerman albums were written in the famous red room where Yusuf stayed after a near fatal bout of TB. 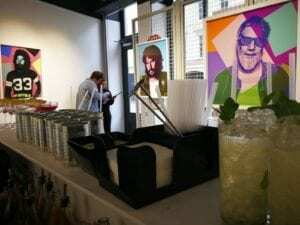 The main gallery space was hung with a mix of Pop-Art portraits of Yusuf throughout his career and art-work for the new album. 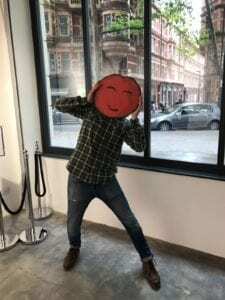 Large cutouts of laughing red apples focused proceedings on the new album and it was special to see some of Yusuf’s original drawings for the album artwork on display. 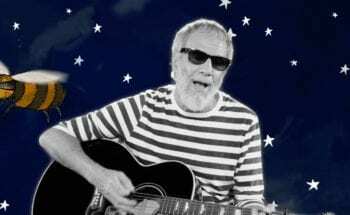 Yusuf has fully illustrated The Laughing Apple, the first time he has since the albums of early 70s. 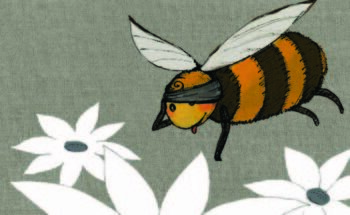 His drawings and designs are wonderful, a gift that actually predates his music making. He’s clearly referencing the visual style of Tillerman and Teaser but there is enough modernity present to reflect the decades that have past. The character of the laughing apple itself is very emoji-like and feels current. When Yusuf arrived decisions were made to use a reduced audio setup. A fair amount of PA equipment was removed which opened up what was quite a small space for the audience. The stage had a red backdrop and was dressed with some cut-outs of illustrations from the cover of The Laughing Apple. Yusuf and Kwame settled into making final preparations as the various event staff and early arrivers buzzed around. Over the next hour or so guests, largely from the industry and close associates, arrived. The space filled and people started enjoying the delicious canapes and a selection of non-alcoholic cocktails that were particularly good. 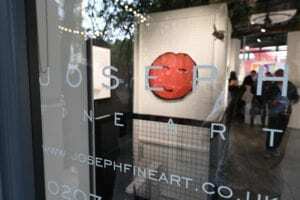 The guests admired the art and discovered promotional CDs of The Laughing Apple and a colouring book, along with colouring pencils, containing the album’s illustrations in their goodie-bags. The gathering spilled out onto the paved space in front of the venue which was not unpleasant on a mild late-afternoon in September. This particular area of London has undergone some recent regeneration and is starting to feel deserving of being at the meeting point of Covent Garden, The West End, and Denmark Street – the historic home of London’s guitar shops and Tin Pan Alley. 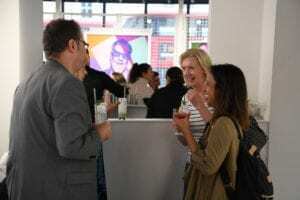 The event kicked off in earnest upon the arrival of Cerys Matthews, the Welsh singer and BBC broadcaster, who was there to host a Q&A session with Yusuf. The two spent a short while enjoying some of the art upstairs before moving to the performance space where a table and teapot had been arranged in the style of the Tea for the Tillerman album cover. The two engaged a warm conversation in which Yusuf spoke about how “Here Comes My Baby” was probably inspired by the fact that his older brother was more successful with girls than him. He also clarified that he had not written “Morning Has Broken” and talked about how he would wander around the bookshops of Charing Cross Road, a stone’s throw from the family restaurant, searching for lyrical inspiration. He discovered the words to the song in the religious section and they resonated with him powerfully inspiring him to come up with his own version. The exchange between the two felt very genuine and Yusuf seemed to be very relaxed throughout. A small time was taken to clear the table from the performance space after the Q&A and then Yusuf and Kwame took to the stage. 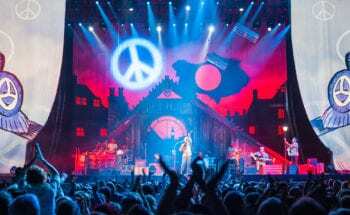 To the delight of the audience they performed “The Blackness of the Night” and “See What Love Did to Me” off the new album alongside a great up-beat version of “Here Comes My Baby”. The audience were captivated by the delicacy of the renditions and there was a little ripple of laughter when Yusuf swapped one of the lyrics of “Here Comes My Baby” to “You’ll never walk alone / And you’re forever texting on the phone”. Speaking to a number of people afterwards there was a prevailing sense that we’d all been very privileged to witness Yusuf perform in such an intimate setting and there was a strong feeling that this was about as close to the experience of being at an early 70s Cat Stevens performance as one was ever likely to experience. After the performance, the audience drifted back upstairs and select guests had photos taken with Yusuf. 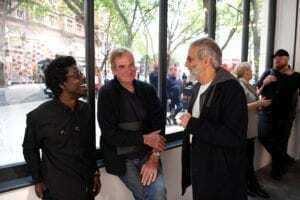 It was a real joy to see that Alun Davies, Yusuf’s long time guitarist and friend had been there for the performance. He and Yusuf shared an embrace that spoke deeply about the affection and bond that they share. Alun is incredibly enthusiastic about The Laughing Apple calling it Yusuf’s most important album for ages. He plays on the album and the old guard is completed by the presence of Paul Samwell-Smith who has assumed production duties for the first time since 1972’s Catch Bull At Four. It’s very evident that there’s been a conscious move to create a record that links directly to the most successful part of Yusuf’s career but it doesn’t feel like a cynical move. Instead, it seems that the stars have aligned to finally reunite a team that delivered music that impacted upon the hearts and minds of millions of fans worldwide. A group of old friends have embraced the opportunity to work together again and the results promise to be incredibly rewarding to both old listeners and new. I only saw Yusuf briefly after the event and, after complimenting him on a great performance, I asked him how he felt it’d all gone. 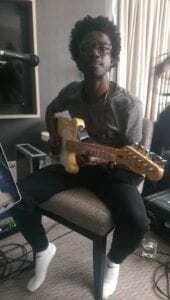 His response was that he’d really enjoyed doing such a small show and that it’d had felt great to be playing just simply with the support of Kwame. There was clearly the sense of a job well done and of a successful event overall. I got the impression that he’d enjoyed it so much that there may be some similar kinds of events booked in for Red Room fan club members in the future but don’t hold me to that!